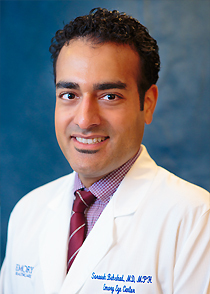 Soroosh Behshad, MD, MPH, joined the Emory Eye Center in August 2016, to work with cornea, cataract, and refractive surgery patients. Dr. Behshad received his medical degree from the University of Arizona College of Medicine, Tucson and Phoenix, AZ in 2011. He completed a transitional year internship at Harbor UCLA Medical Center in Los Angeles, followed by a residency in ophthalmology at Tulane University in New Orleans, LA, that included one year as chief resident. His fellowship in cornea, refractive and external disease was completed at Gavin Herbert Eye Institute at the University of California, Irvine. His master’s degree in Public Health is from the University of Arizona, Tucson, with a concentration in public policy and healthcare management. Research interests include corneal transplantation – the use of femtosecond laser in penetrating and lamellar keratoplasty; endothelial corneal transplantation (DMEK and DSEK); severe ocular surface disease and dry eye. Dr. Behshad received the Annual C.S. O’Brien Professorship Award for Outstanding Research and Resident Presentation in both 2014 and 2015. He is board certified by the American Board of Ophthalmology, a member of the American Academy of Ophthalmology, American Society of Cataract and Refractive Surgeons, Eye Banking Association of America, the Association for Research in Vision and Ophthalmology and the Cornea Society. Dr. Behshad sees patients at the Emory Eye Center on Clifton Road and at Emory St. Joseph’s Hospital.